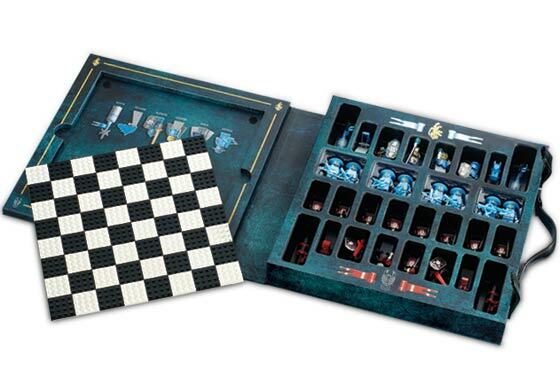 Lego has released an nice-looking Knights’ Kingdom Chess Set complete with carrying case to store the Lego chess board and all the minifig chess pieces. The New York Times had a story earlier this month about the problems faced by high level players in the computer age. 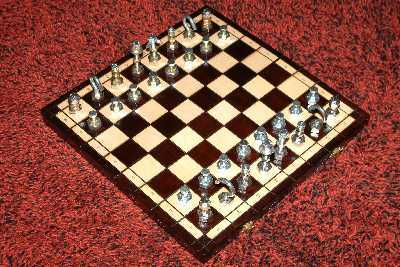 This story wasn’t about computers beating humans at chess, however, but rather about whether or not lesser human players are obtaining unfair advantages because of the proliferation of databases of chess games that make it possible to study their play with computers and occasionally beat them by finding obscure flaws in their game. Mr. Bonin is more active than most elite players, but he is doing what most serious players have long thought is necessary: playing frequently to stay in peak form. Now, however, because of the widespread availability of databases of games and the growing strength of chess software, such activity may actually be making it easier to beat him. Mr. Bonin said that he recently lost a tournament game to a weaker player who had not competed in years, but who had sprung a surprise move on him in one of Mr. Bonin’s favorite openings. “The line he played reeked of preparation,” he said. Of course, as The Times points out, it was in large part due to the urging/suggestion of Kasparov that the preeminent chess database, Chessbase, added sophisticated searching so people can easily find all the games where Kasparov or any other players ends up in some specific position and then analyze how the player reacts, making preparation that much easier. Mr. Ehlvest added that in any case he did not believe that computers made people better than they otherwise would be. Instead, they can help them reach their potential sooner. “Now you see 14-year-old grandmasters because they accumulate information much faster than in my day,” he said. Chess players give ‘check’ a new meaning. Dylan Loeb McClain, The New York Times, January 13, 2005. Author Brian CarnellPosted on January 27, 2005 December 1, 2007 Categories UncategorizedTags Chess, ComputersLeave a comment on Are Computers Ruining Chess? The BBC’s story pretty much sums it up, Kasparov falls to crushing defeat. After thirteen draws and two wins for challenger Vladimir Kramnik, Gary Kasparov’s 15 year complete dominance of chess came to an end. The BBC has a story covering Gary Kasparov’s 16-game defense of his world chess champion title against Valdimir Kramnik. In the 15 years he’s held the title, the only time Kasparov has lost was to a computer back in 1997. The match is sponsored by BrainGames.Net. The web site has will be web casting the games live, as well as providing analysis and annotated move lists of the tournament. They’ve also got a nice page full of past games, complete with annotation, between Kasparov and Kramnik (the two have met 23 times, with Kasparov winning 3 times, Kramnik winning 3 times, and 17 draws).